Is Raj Manhas a man of his word? If Raj Manhas is a man of his word, he will remove Graham Hill from the closure list. However, it now seems clear that at the time this promise was made, Graham Hill was already being targeted for closure. We were scammed. I remain convinced that the entire closure process is flawed… that the CAC had neither the time, the resources, the data or the expertise to make such profound decisions, and that the district has failed to provide reliable data on demographics, enrollment projections, first-choice ranking, and estimated savings. It is also quite clear that criteria were not applied equitably within and across quadrants. No doubt there are some schools that warrant closure, but district officials have absolutely failed to support the assertion that there is an imperative to quickly close a swath of schools now, or that it is developing real solutions to address the district’s long term structural budget deficit. And so Superintendent Manhas, I urge you to step back, take your time, and carefully evaluate each and every school on the list. Visit the schools… talk to the families and staff… walk the hallways for yourself. If you are not absolutely convinced that it is a failing school — under-enrolled, under-performing, and in a sub-par building — then delay closure. Take your time. You can always close more schools next year. But if you blindly follow the CAC’s recommendation under the red herring that no list will be perfect, you will destroy communities that can never be put back together again, while providing no real benefit to the affected students or the district at large. Finally, I want the superintendent to understand that I speak now, not as a representative of our PTA, but merely as an angry parent who happens to have a widely read blog at his disposal. If Raj Manhas is a man of his word he will remove Graham Hill from the closure list. If he proves not to be a man of his word, I promise that I will use what influence I have to remove him from the superintendent’s office. Who knows how it will end up, but for my neighborhood I see a ray of hope. Someone must have noticed the bogus demographic data being used to try to close both fairmont and highpoint elementaries (within 10 blocks of each other) while the highpoint SHA project is being rebuilt. The compromise of moving fairmont in with highpoint (a much newer building) seems to make sense and though sales of schools are not supposed to add anything to the general fund, perhaps this is a good time to think of selling the fairmont property (lead and arsenic in water) to one of the developers now rapaciously buying up every square inch of the delridge- highpoint area. What influence would that be? The RightWingNuts here believe that they are the only ones reading your Blog, that no one pays attention to your “pinheaded” spew. I guess they have forgotten the former head of FEMA, who was compelled to give complete credit for his downfall to Horsesass.org. I agree that the process to close schools is flawed. There is much smokeybackroom goings on when it comes to this kind of a political hot potato. I say give them hell. Don’t let up. Make enough noise and they will cave. Determination and believing in something is a good thing. How much have you folks raised to contribute to keeping the school open??? I have seen poor decisions made in local government and our school districts by caving into a bunch of noise. I’m not saying it isn’t kind of weird that they would close Graham Hill after dumping all kinds of bucks into it….but in Seattle, that is the norm unfortunately. I really think you would have a better chance if parents actually put their money where their mouth is. Have you carefully studied the Graham Hill Budget yet?? Can you find any cost savings? Make a business case Goldy. Emotional cases alone seem so shallow. Now, Goldy, you listen to that Mr. Cynical. He’s a rich man, you know. He didn’t get there being lazy and stupid. I sense that he is also a man of God. Maybe if you prayed, Goldy, you would find salvation like Mr. Cynical. What is the deal with the letter? Is that letter from 2005 or 2006? It says Ed James is going to your school for 06/07 but I thought he had finally really and truly retired. He was my son’s principal at one time. He is the best of the best as far as I am concerned. Cynical isn’t following this discussion at all. He’s in an ideological fantasy land. It has been made clear over and over that Graham Hill parents and community have raised a lot of money compared to other schools of their size. You’d think Goldy would be smart enough to make the connection between years of government funded schools with little accountability, and random closures of even the good schools where the community puts in the effort. Such is the arbitray nature of political correctness and bureaucrats. In fact if anything, putting in more community effort was exactly the wrong thing to do in the failure-first world you progressives has created. It’s humorous to see you take such offense at the very ideas you help promote on this blog every day. I suppose in a future post you’ll suddenly be calling for fiscal restraint and more congestion analysis before tearing down the Viaduct. Afterall, it wouldn’t take much of that $6 Billion price tag to keep Graham Hill open. The letter was sent in March of 2006. 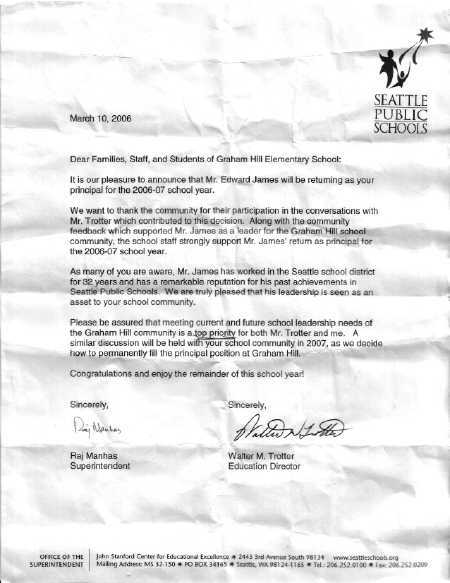 Ed James is a retire/rehire who was brought in as an interim principal this year after Joanne Hill stepped down for “health reasons.” Actually, she stepped down because she received a no confidence vote from the staff due to her incompetence. Ed was only supposed to stay through the end of the year, and then go back into retirement, but he was persuaded to stay on through next year so that we would have the opportunity to recruit a new principal. In retrospect, it seems clear that the reason the district didn’t just foist another principal on us was that they intended to close us. “Cynical isn’t following this discussion at all. He’s in an ideological fantasy land. It has been made clear over and over that Graham Hill parents and community have raised a lot of money compared to other schools of their size. AH HA! Here is where your pointy little ChetBob noggin gets stuck. The biggest obstacle schools face is ONGOING Operations and Maintenance Costs of these buildings. That means you need to continuously raise money to keep these buildings open. This brought back memories of when I was asked to serve on an advisory committee of my kid’s elementary school. The new principal brought out the budget and asked for our recommendations. No background, nothing to compare with regarding prior years, no choices to be made. Most of the other parents just shrugged and said, in effect, “I guess it looks okay to me”. The principal smiled and thanked us for taking our valuable time to contribute to the school. Then I asked her what items were omitted from the budget in favor of the items which remained there. The smile dissapeared. After some questioning, she confessed that neither she (nor the advisory committee) had any control over the budget, it was set by the school district. Then I asked her what purpose we were serving, why not just use the PTA? Her response was that the PTA was good for fund-raising for special projects (new playground equipment, etc. ), but had no purpose other than that. “Schedule conflicts” prevented any more meetings of the advisory committee that year. I wasn’t asked to join it the next year (apparantly the principal makes up the list). Fine with me – I’ve got an aversion to being a rubber stamp, anyway. Anyway, there are lots of fine teachers and principals in the public school system. This principal was not one of them, for this and several other reasons. But Goldy’s description of the process (inadequate data, no training, etc.) of the CAC group reminded me of that experience. Once again , it proves what is the most valuable asset in a child’s educatioonal toolkit , concerned parents . Good job , Goldy . That does sound pretty darn sneaky to use Ed to lull you guys into a false sense of security. I would guess Ed feels a little bit “used” right now too. It’s pretty clear to me that he sees himself as a community builder, not an undertaker. I can’t imagine he would have come out of retirement if he had known what was in the offing. Go find a new school Goldy and get over it already. For anyone with a child in Seattle schools or anyone who pays taxes here, it is not something to get over already. There are a lot of great community and family resources supporting schools in Seattle. But we have to fight to get transparency and rational processes. Inconsistant decision making criteria or excessive short-term action isn’t going to cut it, nor is giving in to noisy whites while throwing PR bones to minorities. That would be where the State of Washington does its “paramount duty”, according to the State Constitution. Whoops. Time for ANOTHER lawsuit. Raise a bunch of money from the cheap bastards you affiliate with and file a lawsuit!! !